Deepak Chopra, educational director of The Chopra Center For Well Being in La Jolla, California, is a pioneer in helping individuals maximize their ability to achieve success and fulfillment through mind body techniques. A best-selling author of both nonfiction and fiction and a leading, internationally recognized motivational speaker, Dr. Chopra is expanding the concept of good health and self-knowledge through a blending of Western medicine with the ancient techniques of Ayurvedic health care. The basic tenet of Ayurveda is that one's physical health is the balanced integration of body, mind, and spirit. Larry James highly recommends the books of Dr. Deepak Chopra, MD. The Seven Spiritual Laws of Success: A Practical Guide to the Fulfillment of Your Dreams - Deepak Chopra - Chopra's teachings are distilled into seven simple principles which can be applied to all elements of personal life to evoke success. The basic idea is that personal understanding and harmony promote fulfilling relationships and material abundance without extra effort: chapters tell how to achieve it. The creation of wealth has always been regarded as a process that requires hard work and luck - often at the expense of others. In this remarkable book, the author of Quantum Healing and other bestsellers reveals how to align with the subtle yet powerful, unseen forces that affect the flow of money in our lives. Ageless Body, Timeless Mind: The Quantum Alternative to Growing Old - Deepak Chopra - Deepak's bestselling title offers an Eastern philosophical approach to the problems of aging. The exercises he offers are illuminating and fun. Creating Affluence: The A-To-Z Steps to a Richer Life - Deepak Chopra - This book explores the full meaning of "wealth consciousness" with clear and simple wisdom. According to the author, "Affluence includes money but is not just money. It is the abundance, the flow, the generosity of the universe, where every desire we have must come true, because inherent in having the desire are the mechanics for its fulfillment." Everyday Immortality: A Concise Course in Spiritual Transformation - Deepak Chopra - In ancient yoga traditions, a sutra is like a pearl of wisdom - a spiritual commandment to ponder. Deepak Chopra has assembled a selection of modern translations from India's Gyan Yoga, known as the "yoga of knowledge." Each page contains a simple statement - intended to be read slowly and absorbed one reading at a time. "Each sentence must be fully understood and comprehended and give you a new insight before you move onto the next," instructs Chopra. "As you progress through these exercises, understanding and insight unfold in sequence." 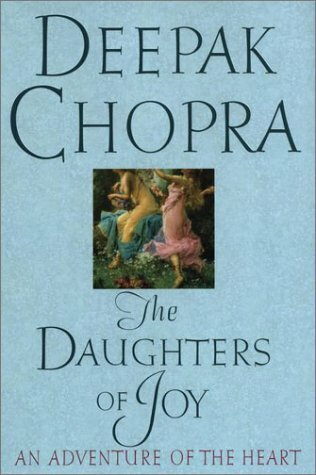 The Daughters of Joy: An Adventure of the Heart - Deepak Chopra - Struggling writer Jess Conover needs a job. But when he meets lovely, willowy Elena on a cold November night in Boston, he is swept into an age-old mystery instead. At first he thinks that it is Elena herself who makes him feel as if his whole reality is about to be transformed. Then Jess discovers that this woman, who talks so knowingly about love, is the leader of a "mystery school" going back many centuries. Click here to contact Deepak Chopra.